...to Orthodox Christian Net! 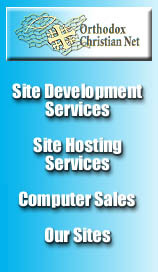 We make it our business to help you have a presence on the Internet. We'll develop and design your Web Site, host it on our Web Server, and provide you with many services which will enhance your site and make it as useful as possible for you and your visitors. And, if you're in need of computer or server equipment, be sure to visit our Sales Page! Orthodox Christian Net will make it a reality! If you are an Orthodox Christian Church/Organization looking for someone to design a web site for you then, Orthodox Christian Net is the one for you as for years we have been creating Web Sites for Orthodox Christian Churches and Orthodox Christian Organizations. Orthodox Christian Net is your complete World Wide Web Solution Source! Last modified Sat, 22 Mar 2003 04:02:18 GMT.